Chief Cliff Quarter Horses is located at the base of Chief Cliff in Elmo, Montana. It is run by Sigurd Jensen and Zoe Lilja--Montana neighbors who share not only a common fence line but also an interest in quarter horses and a philosophy with regard to their breeding. 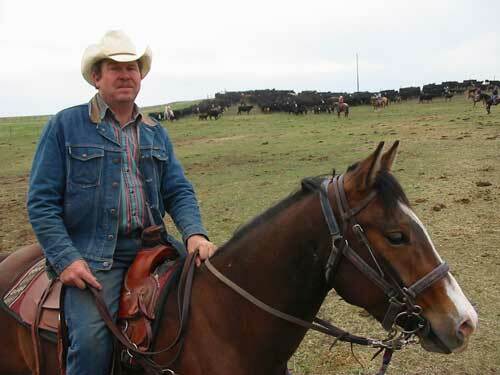 Sigurd is a third generation rancher, so cattle and horses have always been part of his life. He's been around horses--raising, training and chasing cows with them--for most of his life. On top of that, during the 70's and 80's his father raised thoroughbreds and raced them, and his grandfather before that broke teams of horses for the homesteaders in north central Montana. Needless to say, Sigurd has a solid grounding (and education) in agriculture and animal husbandry. Deep down, though, he's still the cow guy. Sigurd's daughter, Kelly, has become more active in the horse operation during the last year. In addition to helping with ranch duties like haying, branding, and cow-chasing, she's been putting in time doing groundwork with young colts and taking some of the started horses up on the hill for some wet-blanket training. Kelly's a big asset to the ranch and relatively fearless (which both makes her dad proud and scares the bejeesus out of him). Whenever Kelly's in the mix, there's sure to be plenty of laughter, lots of good stories, and some great memories. All fun aside, our goal at Chief Cliff Quarter Horses is to raise 5-8 quarter horse foals each year. We raise foundation type quarter horses with Colonel Freckles, Poco Bueno, Jesse James, Doc's Hickory, Doc Bar, Mr. San Peppy, Gunsmoke, Doc Olena and King Fritz right on the papers. We like our horses on the small and cowy side and strive for color when we can get it. All of our foals are calm, friendly and used to dogs, cats, machinery, and the various bugaboos to be found on a ranch. 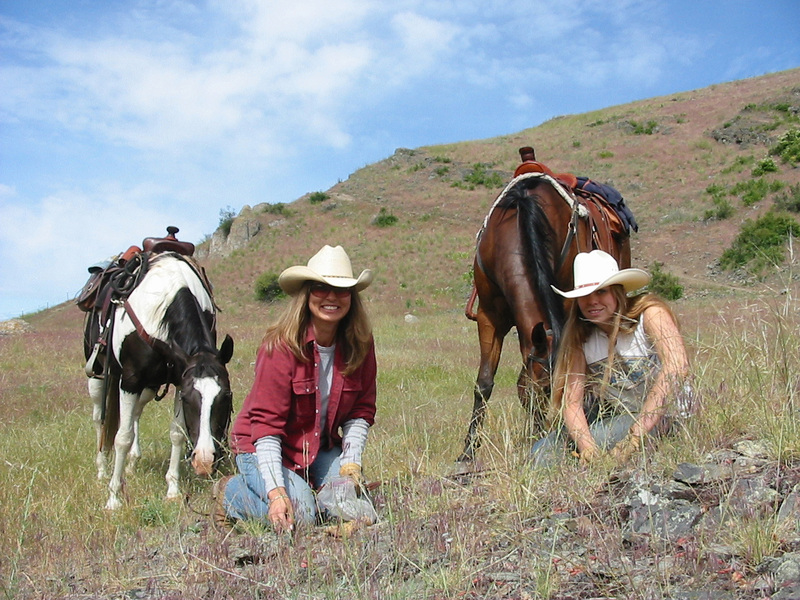 Our horses grow up in the hills around Chief Cliff and are used to traveling through brush, over rocky and uneven terrain, and are accustomed to the elements. Most of our horses go barefoot until training begins, and overall have excellent feet and few hoof problems. This is an added bonus to a fine group of horses with foundation pedigrees, nice conformation, pretty heads, and willing dispositions. In 2006 we lost our primary stud, Freckles Candoo, but not before raising several black Freckles daughters to breed to our blue roan stallion, Hancocks Blue Olena. See the Stallions page for a tribute to Freckles Candoo. We still have a number of Freckles sons and daughters for sale. We've been rapidly growing since 1999 and have sold quite a few horses over the years, both locally and to places we never would have guessed. Chief Cliff horses have made it as far south as New Mexico and Texas, as far west as Washington and Oregon, and as far east as Israel, and we believe all of our horses have found good homes! If you're in Western Montana, enjoying the beautiful views along the shores of Flathead Lake, check out our operation north of Elmo. We're easy to find and are always happy to show off our horses. To the left is Sigurd on "Doc," a son of Freckles Candoo, and Zoe on "Go Girl," a granddaughter of Freckles Candoo. To the right is Zoe with Sigurd's daughter, Kelly, looking at the bitterroots down the Big Draw. Kelly rides "Poco," a horse out of one of our Doc's Hickory broodmares.